If you’re a regular reader of astrobites, you may have noticed that exoplanets are a hot field in astronomy now (yes, that’s 12 separate astrobites)! However, there is also a large number of astronomers devoted to studying the protoplanetary disks from which these planets formed. A combination of space-based infrared observations, ground based sub-mm interferometric observations, and theoretical advances have been driving the field forward for the past 3 decades. In a new review article, Jonathan Williams and Lucas Cieza at the Institute for Astronomy (IfA) describe the life-story of protoplanetary disks from formation from collapsing molecular clouds to the end-state of a planetary system. Review articles like Williams and Cieza 2011 are great services for undergraduate students and graduate students who have learned the basic fundamentals of astronomy and are about to embark on research in a particular sub-field, like protoplanetary disks. Significantly longer than regular journal articles, review articles serve to summarize the current state of research of a field. These articles are written by experts in the field who have had deep and broad experience. Williams and Cieza will appear in print in volume 49 of the Annual Review of Astronomy and Astrophysics. Figure 1: The evolutionary stages of a protoplanetary disk. The typical lifetime of protoplanetary disk is believed to be less than 10 million years (Myr). The flaring of the disk is due to hydrostatic balance. The median mass of Class II YSO disks is 5 times the mass of Jupiter. For a human being, astronomical timescales are often impossibly long to comprehend. The Earth is 4.5 billion years old. The Sun will live for another 5 billion years. Although still out of our reach as humans, protoplanetary disks last only a few million years. Protoplanetary disks are formed almost immediately after the collapse of a molecular cloud. As material further from the protostar with higher angular momentum begins to fall inward, the material will quickly flatten into a disk that surrounds a protostar. The viscosity within the disk continues to drive accretion onto the protostar. These disks can stretch directly adjacent from the protostar to distances of 100’s of AU. Because the dust and gas of the disk is heated by light from the newborn star, the parts of the disk closest to the star will be the hottest and the parts farthest from the star will be the coldest. This dust will emit as a blackbody, thus the hotter material will peak in emission in the infrared, while the colder material will peak in the sub-millimeter. Sub-millimeter radio telescopes like the the James Clerk Maxwell Telescope, the Submillimeter Array (SMA), and the Combined Array for Research in Millimeter Astronomy (CARMA) have greatly revolutionized the study of protoplanetary disks, because they can probe the emission at these wavelengths (roughly 1mm in wavelength, hence the name). Many of the observations with these instruments have helped provide information on the outer parts of the disk. Therefore, this review primarily examines the properties and evolution of the outer areas of protoplanetary disks based upon observations in the infrared and submillimeter wavelengths. Observations of protoplanetary disks are about take a major leap forward with the introduction of the Atacama Large Millimeter Array (ALMA) (Figure 3), a submillimeter array located in the Atacama Desert of Chile. The young stellar objects (YSO) with which protoplanetary disks are associated can be classified into different classes depending on the spectral energy distribution of the combined system. These classes correspond to different ages of the protostar’s evolution. Class 0 and Class I stars are in the collapse and formation phases. YSOs are termed Class II stars when the protostellar photosphere has first become visible. As material from the surrounding molecular cloud is fed into the disk, a spherical cavity in the molecular cloud will open up. However, there has not yet been a convincing direct detection of gas flow onto a disk from the surrounding molecular cloud. (Sub) millimeter interferometry is well-suited to image protoplanetary disks for several reasons. The first, which I already mentioned, is that the thermal emission from the disk typically peaks in the sub-millimeter. The second is driven by resolution requirements. Due to the Rayleigh criterion, we can only resolve images down to where is the wavelength of light we are using to observe and D is the diameter of our telescope. At the distances of the closest disks, a single disk telescope operating in the submillimeter cannot provide astronomers with the resolution necessary to resolve the features of the disk. Enter interferometry, whereby combining many telescopes into an array it is possible to achieve the same resolution as a telescope that has a diameter as large as the farthest pairwise separation between antennas (termed a baseline). Of course, the interferometer will not work as cleanly as a single gigantic dish since some of the information about the astronomical source will be missing, but at least the interferometer is actually practical to build. However, the fact that some information is missing might actually be helpful for the study of protoplanetary disks, because due to the properties of the Fourier transform, interferometers act as spatial filters, which filter out certain spatial frequencies. Thus, interferometers operating at high resolution can filter out some of the lower spatial frequencies, which correspond to the extended structure of the nearby molecular cloud. This ensures that we are primarily observing the emission compact disks (high spatial frequencies). However, one must be careful when analyzing the continuum emission, because the lack of information on low spatial frequencies means that it is possible to confuse emission from small scale structure within the envelope with the continuum. Figure: 2 Spectral Energy Distributions (SEDs) of four different protoplanetary disks, figure from Williams and Cieza 2011. The median lifetime of a disk once it enters the Class II YSO stage (where the stellar photosphere is first visible) is 2-3 Myr. At longer wavelengths the emission from the disk dominates the SED. Here we can see the difference between near-IR excess, mid-IR excess, and far-IR excess. 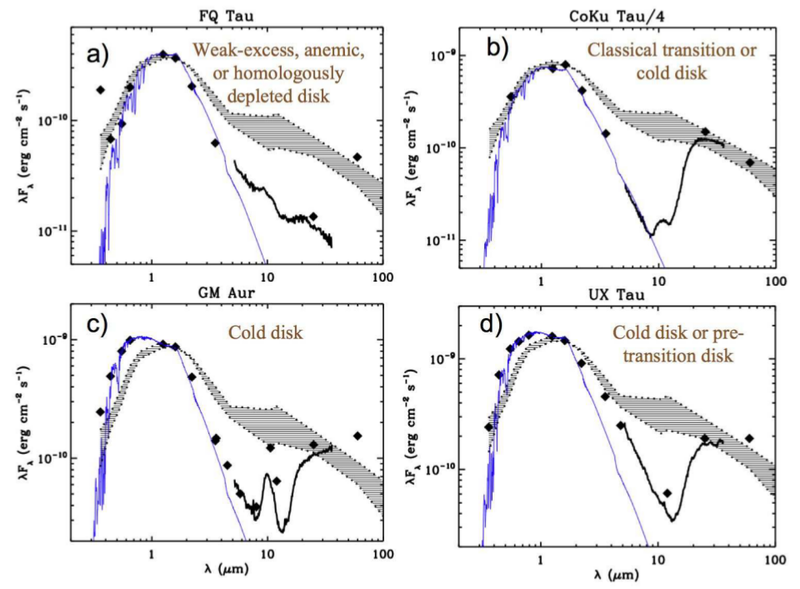 In order to understand the evolution of protoplanetary disks, it is important to understand the different timescales of the processes of disk growth. It has been observed that there is no correlation between the disk mass and the evolutionary state among Class 0 and Class I YSOs. This implies that disks form quickly and material is rapidly transported through the disk to be accreted onto the star, thus disk mass does not increase even though the core collapse should be delivering more material to the disk. This rapid transport of material through the disk that may be due to disk instabilities, and will result in episodic mass accretion events onto the protostar (Figure 1a). For more on episodic accretion for low mass star formation, check out the new article on the arXiv by Stamatellos et. al. Once the Class I phase has finished and the Class II stage has begun, the disk can be considered protoplanetary instead of protostellar, since the star has drawn most of it’s mass from the disk at this point. According to Williams and Cieza, the evolution of Class II YSO disks is dominated by “accretion onto the star, photo-evaporation from local or external radiation sources, agglomeration into larger bodies, and dynamical interactions with stellar or sub-stellar companions.” This sounds like the most interesting time to study disks! Most of the resolved radio emission from disks is optically thin, which means that we can see all of the emission from all of the dust, and therefore the emission traces the mass of the disk. However, the inner parts of a disk (< 10 AU) where most of the planet formation might occur are likely to be the most dense (Jupiter is at a distance of ~5 AU from our Sun). At this point in their evolution, these disks are believed to be gravitationally stable in their inner regions, and disk self- gravity is negligible. Protoplanetary disks are generally composed of gas and dust particles. In the interstellar medium (ISM), dust is made up of silicates smaller than 0.1 microns, along with graphite and polycyclic aromatic hydrocarbons (PAHs). In a disk, these dust grains agglomerate through collisions. Most of the gas in a disk is diatomic, molecular hydrogen, , and gas accounts for 99% of the total mass of the ISM, and initially, protoplanetary disks. 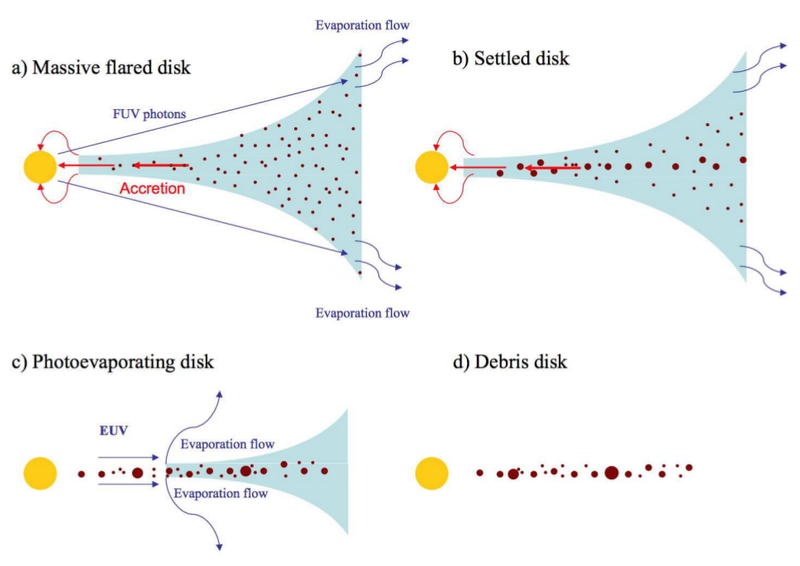 The lifetime of disks set limits on the relevant time scales for physical properties that drive the dissipation of the disk, as well as the upper limit on the duration of planet formation. The Spitzer satellite observes infrared light that probes the planet-forming regions of the disk. By 8-10 Myr, primordial disks with infrared excesses are rarer, implying that much of the disk has dissipated by this time. Spitzer‘s “Cores to Planet-forming Disks” observational program collected 24 micron measurements that revealed that very few objects that do not have near-infrared excess (hotter, closer material) have a mid-infrared excess (cooler, more distant material). This implies that once accretion onto the star stops and the inner disk gives way to an inner hole, the entire disk will then dissipate rapidly (Figure 1 c). Theories of protoplanetary disks attempt to confront the “two time-scale” problem, where material can survive in the disk at at a large range of radii (0.1-200 AU) for many Myr, while the actual process of dissipation of the disk takes place in a much shorter span of time. This abrupt dissipation after a significantly longer disk lifetime is, at first glance, strange. This dissipation could be explained by the “UV switch” model, where, once accretion onto the star stops, photoevaporation from UV photons clears the circumstellar gas quickly. Higher mass stars will clear their disks quicker, due to higher accretion rates and the increased radiation field. Hotter stars emit more energetic photons, while lower mass stars will retain their disks for longer. Once the inner disk is drained and a hole has developed, the inner edge of the disk is directly exposed to these UV photons and the disk begins to photoevaporate away beginning with the inner edge. This disk then becomes a transition disk, which, at most, comprise 20% of the observed disk population. Based upon observations, the time spent as a transition disk is relatively brief, which implies that the near-IR excess of the SED always disappears before the mid-IR and far-IR excesses do, which means that the disk is clearing from the inside out. Additionally, a lack of near-IR excess could imply an inner hole in the disk due to giant planet formation. About half of field stars (that are not formed in clusters) are in binary systems or higher multiplicity systems. Disks around these binaries provide important constraints on dynamical models of disk evolution. The seminal theoretical paper, Artymowicz and Lubow (1994), established truncation relationships for binaries with nearly circular orbits with semimajor axis . The authors conclude that dynamical truncation limits the outer edge of circumprimary disks to less than and the inner edge of the circumbinary disk to greater than . As one might expect due to the more complicated dynamics, there is an observed connection between binaries and premature disk dissipation. Given the observed semi-major axis distribution of binary systems, the disks around most binary systems should live to be 10% the age (~ 3 Myr) of single stars. Williams and Cieza mention that the effect of metallicity (essentially the dust-to-gas ratio, since the dust is mostly “metals” and the gas is mostly ) on the evolution of protoplanetary disks is not well known. However, it has been observed in exoplanetary systems that the higher metalicy of the host star is strongly correlated with the detection of “hot Jupiters,” which are massive planets that orbit close to their star. Dust grains in the disk collide, agglomerate, and settle into larger grains. As these grains accumulate size, they are eventually massive enough (and their surface area is small enough) that their motions decouple from the gas, and they will settle towards the midplane of the disk, where turbulence and vertical mixing will prevent stratification of grain sizes. Interestingly, there are several dust coagulation mechanisms, such as Brownian motion, differential settling, and turbulence that are efficient enough to capture all of the small-grained dust (less than 100 microns in size) within 10,000 years. But, emission from dust at these sizes is clearly observed in disks. Therefore, there must be some process that is replenishing the dust such as dust fragmentation from collisions. Planet formation models have run into the “meter-sized barrier,” where anything that accumulates larger than this scale is expected to be re-fragmented through collisions and then cleared from the disk by rapid inward migration. This “meter-sized barrier” is a serious hurdle for models of planetesimal formation. As one can see, there is plenty of exciting research waiting to be done on the evolution of protoplanetary disks!